The Earth is heating up... you may have heard or read about it recently. Global Warming is a common theme among environmental and energy groups alike. Simply put, the emissions from various energy sources are spreading to the air and trapping heat inside the atmosphere. This is causing a long list of problems, from less predictable weather patterns to rising ocean levels due to melting glaciers. According to the National Geographic website, record heat waves are about five times as likely to occur because of these atmospheric changes, and a section of the West Arctic Ice Sheet is on the verge of collapsing, which would raise the global sea level by four feet or more. It's dramatic global changes like this that are affecting how we humans can live and function. Can you imagine if the world's oceans rose more than four feet? Coasts would be drowned out and people would have to move inland, making inland areas more crowded. Islands would simply disappear. Most of Hawaii and large sections of Japan would be lost entirely. Now, this may sound melodramatic, but the problem with Global Warming is that we can't predict its exact effects. The most we can do is guess and do our best to slow, or even stop the progression of Warming before the worst damage is done. Many attribute the start of global warming to the Industrial Revolution when coal became the energy source of choice. The soot and smog began there, and coal has been the majority holder of energy market share ever since. This means humans began sending CO2 into the air in the late 1700s to early 1800s. According to the American Institute of Physics, the CO2 level in the air at the time was around 290 parts per million (ppm). In 1896, a Swiss scientist named Svante Arrhenius proposed the first calculation for determining global warming that was caused by human emissions. Obviously this was only the beginning, as studies into the causes and speed of global warming still continue today. The main problem with these calculations is that they cannot possibly take into account every environmental change in the world. What they can do, however, is estimate the levels of CO2 humanity produces today and how much we need to cut back on to reduce the risk of harmful effects in the future. Currently, the greenhouse gas levels in the air are about 395 ppm, which is about 41% higher than pre-industrial levels. To avoid the worst impacts of Global Warming, it's been suggested that we try to stabilize those levels at about 450-550 ppm. This would limit the Warming to about two degrees Celsius, which is the agreed-upon estimate of where major environmental changes would take place. As we stand now, the world will have to reduce its rate of greenhouse gas emission by between 50% and 80% to have a hope of slowing and eventually halting the rise of those parts per million gas levels. Without some major innovation, we might not make it. This is not to mention the fact that increased emissions are simply making people sicker. Perhaps you've seen a picture or two of Chinese citizens out for a stroll? China is the world's largest energy importer, and coal provides the majority of its energy needs. In recent years, there's been a clear call to reduce this reliance on coal power. Studies by a Berkeley Earth research group have shown that the smog in China contributes to as many as 4,000 deaths every day. 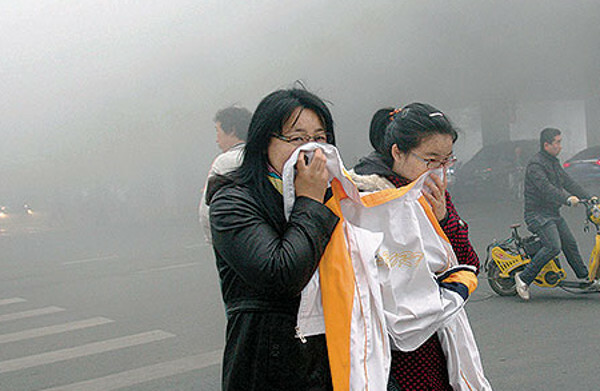 China may be the most extreme example of the harmful effects of emissions, but it's certainly not the only one. Scandal gripped the world when Volkswagen was caught cheating on emissions tests for its diesel vehicles. As the investigations into these digressions went on, the company admitted to more and more cheats in more and more cars. The original estimates claimed that the extra emissions that went unaccounted for in Volkswagen's cars between 2009 and 2015 amounted to about 19 million cars' worth of nitrogen oxide (NOx) in the air. And that's just what was actually accounted for! Global Warming due to emissions is an issue shared by every country in the world. Luckily, many have already begun the transition away from dirty fossil fuels and into cleaner renewable technologies. Every theory has its skeptics, and Global Warming is no different. One of the biggest points skeptics like to make is that there was a pause in the Warming between 1998 and 2002. This claim is made on the basis that between those years, the temperature of the Earth plateaued. Some believe this means that global warming is not nearly as drastic as science would have us believe. What you have to understand is that 1998 was a hot year to begin with. 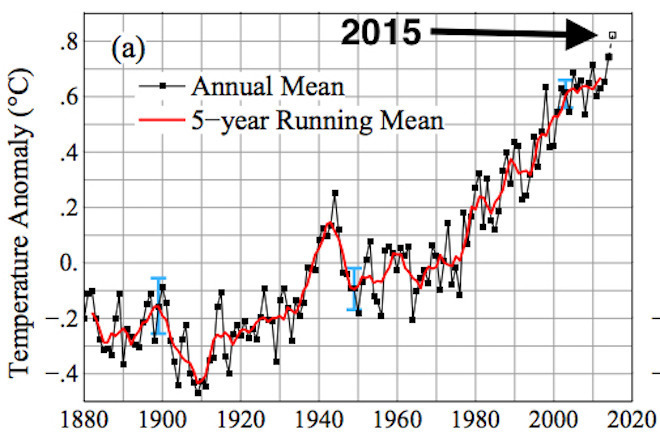 El Niño was strong that year, and caused new record temperatures for the time. And if you start by looking at a comparatively hot year, the next few years are inevitably going to look less dramatic. Even if the period between 1998 and 2002 was relatively calm, looking at the whole of the data shows there have been significant changes over time. Those four years cannot be representative of the whole of the Global Warming issue. It's simply not logical. One could get the same results only looking at a small portion of a stock chart. Of course the company was doing well between 1998 and 2002, but now it's crashing. All the data needs to be taken into account. And with that data in place, it's time to take some preventative actions. The biggest step towards a cleaner global climate was taken at the end of 2015 at the 21st Conference of the Parties (COP 21) in Paris, France. There, nearly every country in the world signed an agreement, now known as the landmark Paris Agreement, which stated that each country would set its own emissions reduction goals and report the results every five years for review by other countries. Since then, several countries including the U.S. have pulled out of the Agreement, but its impact still stands. The sharing of responsibility is an essential part of reducing the emissions levels worldwide. The proposed 5-year reviews will help keep the comparisons of the wildly different energy economies in check. For instance, the country of Iceland achieved very nearly 100% renewable energy for electricity by the end of 2014. However, the country's total population is just under 335,000, which is hardly comparable to the 1.379 billion people in China, or even the 323.1 million people in the U.S.
A closer comparison would be Paraguay, which produces so much hydroelectricity that 90% of it is exported and the last 10% covers domestic demand. However, even this country only has a population of just over 7 million, its electricity consumption of just over 1,500 kilowatt hours per capita barely compares to the U.S.'s nearly 13,000 kWh per capita. But these countries have still created a model which larger countries can follow, if only in smaller stages. For instance, Canada has pledged to make some major changes by 2030. The country plans to phase out all coal power by then, and reduce the emissions levels that stem from oil sands operations. What's more, Canada will implement a carbon tax, which will incentivize individual emissions reduction throughout the country. These federal taxes will mimick carbon taxes implemented in a number of individual Canadian provinces, including the home of the country's largest oil sands operations, Alberta. In all of this hubbub, there is a lot of talk of reducing emissions levels. Part of it will be divesting coal power, but that won't be the only step the global energy market needs to take. Renewable energy will be the key to a cleaner climate moving forward. Renewable technologies are the main point in every emission reduction plan, as they will be needed to replace all the fossil fuel energy that gets shut down. 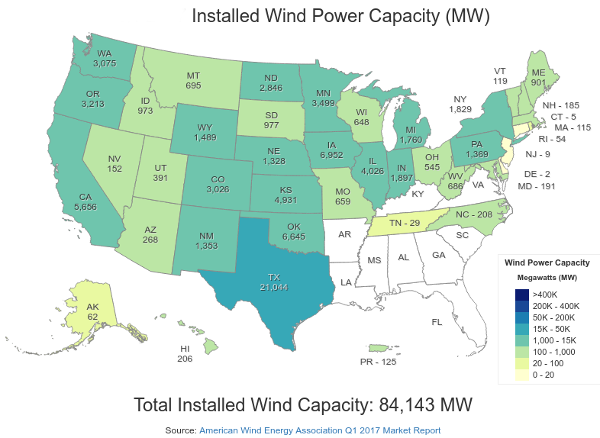 Below you can see the U.S. installed wind power capacity by state as of the first quarter of 2017 as reported by the American Wind Energy Association. Even given wind's growth, solar is still one of the most popular forms of renewable energy, and is expected to grow at an even faster rate than wind power in coming years. Solar in the U.S. is expected to reach a capacity of 22 GW by the end of 2018. The top states for this energy source as of 2016 were California (18,296 MW), North Carolina (3,016 MW), Arizona (2,982 MW), Nevada (2,191 MW), and New Jersey (1,991 MW). Unlike wind power, solar can be applied to individual houses, distributed via community solar programs, or installed in large energy farms. This has helped the growth of solar energy, as businesses and homeowners have shown individual interest in becoming solar-powered. More and more, big-name companies are switching to wind and solar farms to power their businesses. Apple (NASDAQ: AAPL), Google (NASDAQ: GOOG), WalMart (NYSE: WMT), Johnson & Johnson (NYSE: JNJ) and more all have renewable energy farms to power their massive data centers and operations warehouses. The Tesla (NASDAQ: TSLA) Gigafactory will be solar-powered as well. And Tesla continues to push for yet another emissions reduction strategy: all-electric cars that don't burn gasoline. For investors that want a piece of this action without investing in these individual Big Wigs, there are plenty of renewable energy ETFs with portfolios made to profit handsomely as clean energies spread all over the world. To focus investments in the U.S., two major ETFs are the PowerShares WilderHill Clean Energy Portfolio (NYSEARCA: PBW) and the First Trust NASDAQ Clean Edge Green Energy Index Fund (NASDAQ: QCLN). To invest in an array of global clean energy companies, investors can join in with the Market Vectors Global Alternative Energy ETF (NASDAQ: GEX) or PowerShares Global Clean Energy Portfolio (NASDAQ: PBD). China wants renewables, India wants renewables, and the U.S. is still pushing for even more wind and solar power. The three biggest energy consumers in the world are in for the long-haul. And if that's not striking enough, Oil Major Saudi Arabia is even bullish on renewables, solar especially. The world is making the move toward clean, sustainable energy. There's a chance to cut down on the growth of emissions and stop the oncoming harmful effects of Global Warming. And, of course, there are plenty of ways for investors to buy into this movement. Make your own gains changing the world for the better.